Caltha palustris, commonly known as Marsh Marigold, Kingcup or Cowslip is a herbaceous perennial, closely related to various species of buttercups. Marsh Marigold is easily recognized in spring by its large bright yellow flowers. Blossoms have 5 petals with a fluffy center of yellow stamens. The flowers are held high above the foliage, two to a stalk, each up to two inches across. The attractive waxy foliage is a lush dark green consisting of a mound of kidney shaped, toothed leaves which grows low to the ground - sometimes creeping. The leaves are quite large and succulent and can be prepared and eaten like spinach. This is an ideal specimen for bog gardens because of its preference for muddy soil. In the wild, it is found along streams and riverbanks and where ever there are moist, swampy conditions. It is one of the earliest wildflowers to bloom, beginning in March and continuing through May and June in zones 5 to 9. After foliage has matured in the fall, the plants will begin their dormant period. This is the best time to propagate by simply dividing the root clump and replanting the sections. Marsh Marigold should be located where it receives at least partial, but not full sun. It makes a lovely companion plant to iris which like similar growing conditions. You can put the plant at the edge of your backyard pond where it is sure to keep its feet wet, or you can use containers and submerge to a level just beneath the crown. 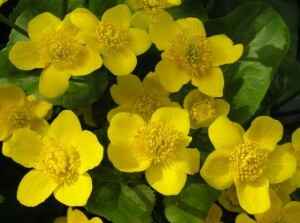 Caltha palustris has been hybridized to a certain extent and there are now several superior cultivars available in nurseries. The varieties Flore Pleno, Multiplex and some others are double flowered.